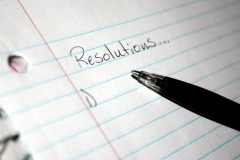 Another year is here and many people are thinking about resolutions. For some, resolutions are part of starting a new year. Others have turned their backs on them because, quite frankly, they usually don’t have much staying power. Whatever your personal bias on resolutions, I challenge you to resolve to make this one change this year — being present for those you lead. A quick reminder, as a manager and leader, your people are your work. Your job is to equip them to achieve results and to get work done through them, not in spite of them. So, as this New Year starts, resolve that next time that knock happens, you’ll turn away from your computer or smartphone or tablet. You’ll turn the ringer off on your phone. You’ll clear some mental space and be present for the other person. Resolve to minimize the distractions so that for the 5 minutes or 15 minutes or 60 minutes this person needs of you, you are there to help him or her focus, to answer questions, educate, brainstorm, listen or direct so that that individual is able to move his or her work — your work — forward.